In 2002 S.T. Dupont pays tribute to Mother Nature with Inspiration Nature, a collection of limited edition lighters that combines the exclusivity of platinum respectively with mother of pearl, hematite and ebony, some precious materials from the animal, mineral and plant kingdoms. 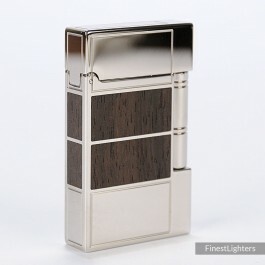 This is the ebony Line 2 lighter, with platinum finish and inlays of ebony from the island of Celebes (Macassar). The lighter is limited to only 2000 individually numbered pieces.